Tamil Muslim grannies show their love through their cooking. They are also fiercely protective and rule the family with an iron fist, but they play the “I’m only a woman – what would I know?” role to the hilt. If my grandad was the head of the family, granny was the neck. She made the head turn as she saw fit! She’s only 4 feet tall, but my god, she could manipulate you to do anything. When I’ve spent some time with her, I usually land up doing things I wouldn’t normally even think of. Sometimes it’ll take me a good week before I even realise what she’s been up to! Anyway, back to food! To my granny cooking is almost a religion. If she’s cooking for a large crowd, she’ll even start the process with a prayer. She’s cooked for wedding functions and religious holidays, and her Birni recipe is the best I’ve ever had (no – I’m not biased). 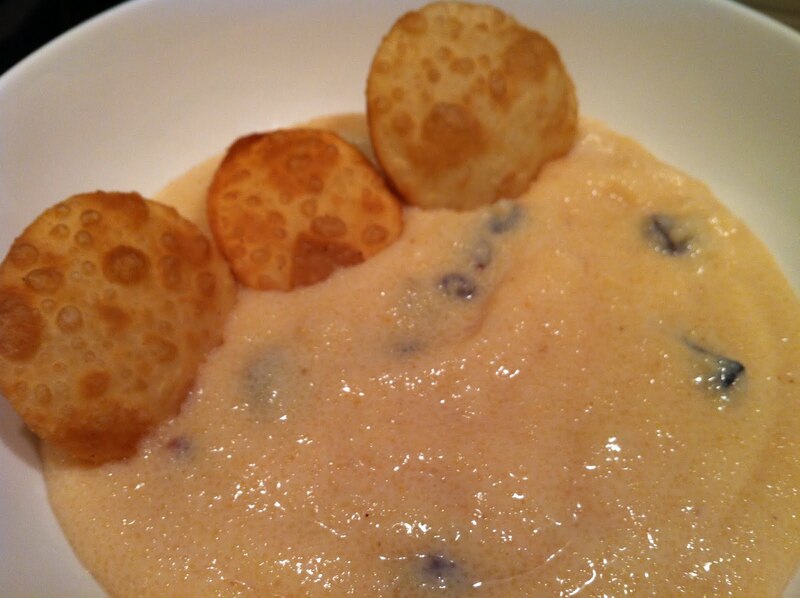 Birni is slightly different from Phirni. I’ve never actually had Phirni, but I understand it’s made out of rice. Birni is made out of Semolina. It is usually served with Tomato Pachadi at weddings or with Coconut Pooris. It’s a must at Tamil Muslim wedding receptions. You won’t hear the end of it if the Birni isn’t up to scratch. Every guest will express his or her displeasure on the way out. My granny’s version is creamier and richer than any other. It’s easy and cheap to prepare and will serve a large crowd easily. As it was Eid last week, I thought Birni would be a great way to celebrate. Once the Rava is roasted, pour water into the pan and keep stirring until Rava is well cooked. If needed, add more water. You want the Rava soft and edible. Birni is usually served warm and liquidy, My mum loves it chilled and thick though, like halwa. It’s entirely up to you! My granny serves her Birni with Coconut Pooris. Mix the Maida and ghee, add enough coconut milk to form a tight dough. Roll out thinly and using a cookie cutter, cut out small rounds. Drop the rounds into hot oil, they should puff up like pooris, turn over and fry the other side until crisp. Serve with Birni.